The Teeter EP-960 is the top product in Teeter's ComforTrak series. It promises an enhanced user experience with its advanced features and better back-pain killing capabilities than its predecessors. In the United States, back pain is a big problem for many. In fact, it is one of the most common excuses for missed work. Millions of Americans suffer from back pain every single day. 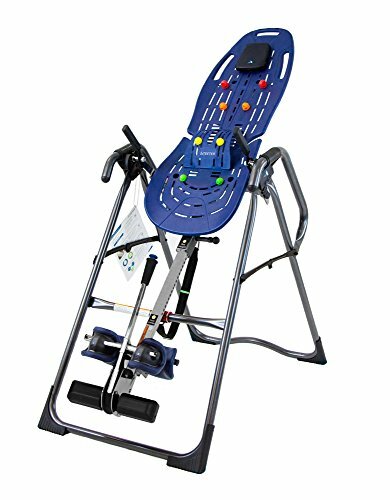 Equipment such as the Teeter EP-960 offer great relief through inversion table therapy. However, is it worth paying for the product? Let's find out in this review. The average person spends 12 hours sitting in an upright position in a single day. In consequence, tension piles up in the lower back. This makes inversion therapy an important practice more than you might think. Instead of stretching the back manually through chiropractic practices, inversion therapy requires the individual to suspend himself or herself upside down for several minutes. The activity allows gravity to pull your upper body and stretch the spine, introducing relief to the lower back muscles. 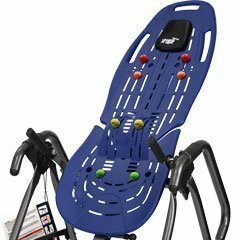 Inversion table therapy provides progressive back pain relief. In fact, it reduces the risk of sciatica. 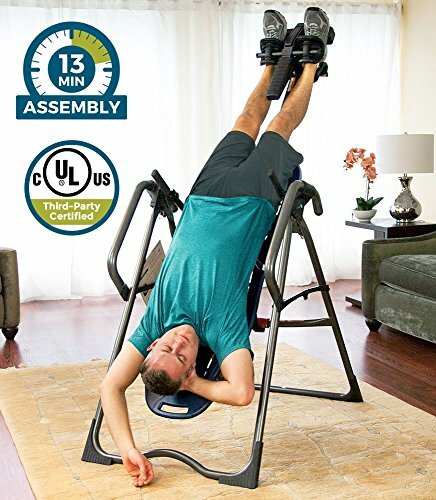 The best thing about inversion table training is that it doesn’t require you to have amazing athletic abilities to perform the required movements. As far as great inversion therapy experiences go, Teeter's ComforTrak series flagship product Hang Ups EP-960 proves to be one of the most secure, comfortable, and durable inversion tables available on the market. It is made from strong plastic parts coupled with a heavy-duty steel base capable of carrying virtually any weight. Technical specifications indicate that it can accommodate people between 142-198cm in height and support weights below 300lbs. Pivot bearings and heat-treated steel parts ensure that there is no shaking and imbalance when you use the product. Every element is scratch-resistant too. 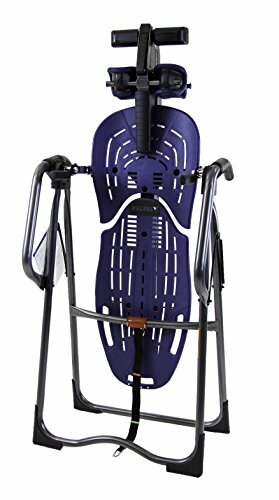 In addition, Teeter's excellent design supports your back, locks your ankles in place, and uses auto-locking mechanisms to ensure you do not fall off or experience any accidents during its use. While you may find other inversion tables brands at lower prices, Teeter offers ingenuity and experience in designing and manufacturing their products. In fact, it is their high standards that made the US Food and Drug Administration (FDA) provide its seal of approval on all products. Additionally, Teeter provides a 5-year warranty on all of EP-960's parts and fittings. We believe that the product's quality construction, FDA approval, and lengthy warranty justify its price. Teeter assembles majority of the table when it arrives at your doorstep. Instead of a manual, it includes an easy-to-follow instructional video to help you complete the assembly. In addition, the video also includes basic exercises you can perform. You can quickly get started with one of the five 10- to 20-minute back stretching and strengthening exercise classes developed by Teeter's own chiropractors and fitness pros. In some inversion training programs, there will be a need to reach your ankles. For some, this might be quite difficult. But the EP-960's EZ-Reach Ankle System provides you with an extended handle to lock your ankles quickly. This allows you to make any movement required with ease. The EZ-Stretch Traction Handles are a new feature on the EP-960. These handles are part of the heavy-duty steel body of the table. The lengthy handles make it easier to invert and get right back up to your upright position. In fact, it allows beginners to easily execute various stretching exercises. This feature allows you to change positions quickly and easily, regardless if you need to be at 20, 40, or 60 degrees. Using the EZ Angle Tether Strap, you have accurate and full control of your inversion angles. In turn, the entire inversion process becomes seamless. The EP-960's ComforTrak bed has also been updated. It now consists of two folding pieces. In addition, the bed has a removable pillow. Teeter has spent a lot of effort in designing their beds. When not completely inverted, you will feel almost no back pressure at all. In turn, you can achieve great results once you begin inverting and stretching. Teeter's trademark Ergo-Embrace Supports are present in this product. Their purpose is to distribute your weight evenly across the ankles and your feet. This results in a comfortable, secure, and relaxing overall experience once you begin your inversion routines. If you need additional back comfort while you perform your routines, then consider purchasing the additional Teeter Better Back Vibration Cushion. It offers excellent neck support. While you will pay an additional sum, you will receive a 10-variable intensity vibration motor for optimum back comfort. The optional neck support helps improve back decompression and curvature on your cervical spine. In addition, it has a light-heating feature that helps relax your muscles in the upper back and shoulder area. The cushion is made of premium polyfoam and covered in microfiber material. To power the vibrating motor, you receive a 120-Volt AC Adapter along with the entire package. The Teeter EP-960 and EP-960 LTD have the same design and purpose. However, they differ in a few aspects. The EP-960 LTD includes acupressure nodes and a lumbar bridge. The nodes allow the table to apply pressure in different areas around your back as per the principles and practice of acupuncture. These soft, multicolor nodes relax your nerves and your lower back muscles as you invert. The EP-960 LTD's lumbar bridge allows you to adjust your back's curve in different arches. In turn, this improves the back-pain relieving capabilities of the product. The Teeter EP-560 is an older inversion table. Just like the EP-960 LTD, it has acupressure nodes in different areas and a lumbar bridge for customizing your back's arch. However, it lacks the EP-960's innovative EZ systems. While it does have ergonomic ankle cups for great fit and a contoured bed, EP-960 has a better auto-locking and ergonomic mechanism that reduces the risk of falling during inversion. In addition, the EP-560's shorter turning handles introduce a difficult learning curve compared to the EP-960's easy-to-use lengthy handles. In terms of weight and durability, both the EP-960 and 560 have frames weighing 75lbs and capable of carrying individuals with a weight below 300lbs. Similar to the EP-960, the previous series model EP-950 has a heavy-duty steel A-frame base and a comfortable bed for your back. Another similarity with the EP-960 is the EZ Angle tether strap's presence. However, its turning handles are shorter than EP-960s. This might make it difficult to use for those who are still new to inversion therapy. In addition, its ankle-lock system is not automatic. Advanced users will find the ratchet ankle lock system easy to use. However, it will take some time for inversion therapy first-timers to feel secure once they begin inverting. The EP-970 is the evolution of the EP-960. It includes acupressure nodes and a lumbar bridge similar to the EP-960 LTD. 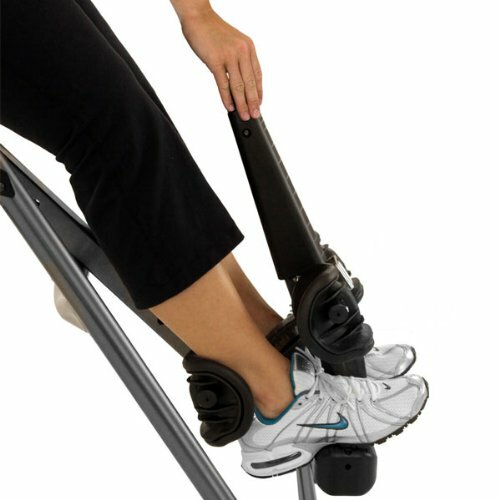 In addition, it has extra long Stretch Max Handles and Traction Handles for added stretching and movement assistance. The EP-970 also includes EZ innovations (with some exceptions) and the ComforTrak bed you'll find in the EP-960. Just like the EP-960 models, the preset rotation control in EP-970 is efficient. However, unlike the EP-960 and EP-960 LTD, the EP-970 LTD has a deluxe EZ-reach system for improved ankle lock and comfort. The Ironman Gravity 4000 is a few leagues away from EP-960's features. While its memory-foam nylon backrest provides great comfort and back support, it has very narrow handles, making inversion and turning quite difficult for beginners. In addition, the memory foam provides comfort but will not stretch or accommodate changes in your back's position when you begin your routines. However, it can support individuals that weigh up to 350 lbs. It also has a convenient foldable waterproof PVC mat that helps reduce noise and improve stabilization while you undergo the therapy. The EP-960 is a must-buy inversion table. With its innovative and secure mechanisms, those with varying inversion experience will have no problems operating the machine. We definitely found its extended handholds and bars the most helpful compared to other products in the series. Most first-time inversion practitioners (and even some experienced ones) find the lack of handles troublesome. In addition, the EP-960's EZ Ankle System makes inversion workouts easier to perform. Aside from the top-notch equipment, the five exercises included in the package are easy to do. In fact, they introduce you to the different features of the product, their proper operation, and the feeling that you should receive in your back and other muscle groups while you go through the routines. Overall, we highly recommend the EP-960 because of its innovative features, durability, and efficacy despite it being a relatively midrange model in the ComforTrak series.